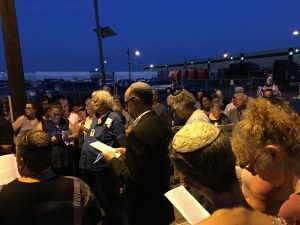 Rabbi Elliott Tepperman of B’nai Keshet organized a community Tisha B’Av service outside the Elizabeth Detention Center (ICE). Clergy from many synagogues led the service which included the chanting of Eicha (Lamentations) and reading of the entire book. The history of this saddest day on the Jewish calendar includes the destruction 1st and 2nd Temples and the Spanish expulsion. The history of being forced immigrants and refugees resonates with the status of many people today. 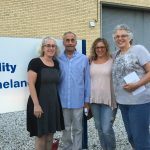 Representatives from TBA participated in the Tisha B’Av Service.